I called tod. I'm going to go with the sidewinders, and I think he'll beat summits price on all the other parts I need too. I've lost track. Did you ever measure how far down the pistons are? Last edited by cudadoug; 03/06/16 05:55 PM. My pistons are down something like .150 or equally abysmal. You might ask Todd to mill them to 70 or 72 cc to get some CR back. That might be money well spent if he is already taking them apart and checking them.. Obviously do the intake side too. If the replacement pistons result in higher in the bore ring travel, that might be a problem. If you cut them to 80 cc and cut the intake side the valve cover rail gets thin, at 70 I think it would disappear. I think others have cut the Stealths to 72, but never done it myself. Ive only installed a rope seal with the crank still in the engine. I used rtv where the seal ends meet each other. When installing a rope seal with the crank out, do you use rtv in the retainer before laying the seal in? do you use rtv in the retainer before laying the seal in? If you have a shop do it (smart move) take your cam so they can trial fit it after they install the cam bearing. 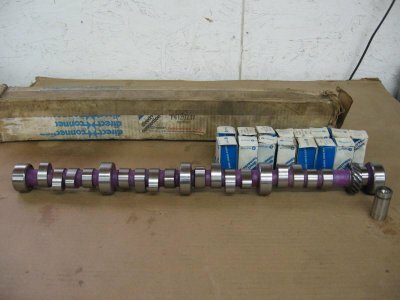 Big block MOPAR and small block Fords are the hardest out there to get in and NOT get a tight bearing. I did ok on my hone job as far as I can tell. Couldnt nail down the ideal 45 degree hatch, was closer to 30 degrees. Some cylinders had steady hatch, but some of the areas I reamed wouldnt blend completely with the rest of the cylinder. Last edited by RapidRobert; 03/09/16 02:51 AM. At this point you are just a punch and pistons from a totally fresh short block. Not finishing the deal might be penny wise and pound foolish. Some cylinders had steady hatch, but some of the areas I reamed wouldnt blend completely with the rest of the cylinder. Can't see picture at work , but not surprised , this is what happens when a novice uses a ridge reamer. For the record, I'm a novice and after having to sleeve a block because a hack went at it with a ridge reamer I'd never recommend it''s use. Again, a photo of metalwork can be really deceiving. 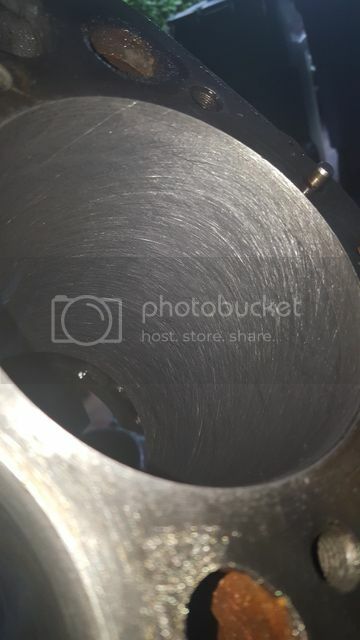 That pic makes you think some freak went after the bore with a piece of 40 grit paper. That can very likely be the camera picking up reflections and making things look worse. In reality, the bore can be smooth as a baby's bottom and we'd never know. There is no sign of the ridge reamer work so it could either be a nicely done job or an excessively deep cut. The bores should be very smooth to the touch. I don't see any trace of oil in the bore. You needed to be oiling it before, during, and after honing. If not, you'll have lots of blow by and the rings may never seat.